Cofferdams: In an engineering structure, such as a bridge pier, has to be built in an area covered with water, e.g. in the middle of a river, the area where the work has to be done is surrounded by a cofferdam. A cofferdam is a well made of earth materials, of steel or timber sheet piling, or a combination of various materials. Under actual working conditions, it is impossible to build a perfectly impervious cofferdam and as such there is always some seepage though the cofferdam, and the water has to be pumped out of the working area. Cofferdams also are used, to protect a working area against a large influx of subsurface water. 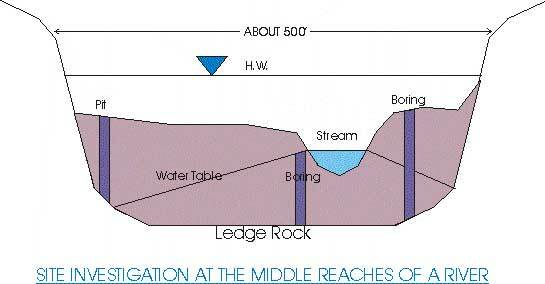 A simple type of water cofferdam is shown in figure. Water seeps both through and under an earth embankment built in the river. An essential point of the cofferdam is a ditch dug within the working area and parallel to the embankment. The ditch acts as a center of attraction for the flow lines of the seeping water. The pumps standing on the embankment throw the water back to the river. Sheet piling used for the protection of the working areas may be of timber for water depths up to 10 ft. or of steel of a great variety of cross sections. A type of one-wall sheet piling cofferdam is shown in the figure. The sheet piling is driven to a depth below the base of the proposed pier until it is well embedded in the surrounding soil, and the material inside the cofferdam is excavated by dredging. Caissons:The term 'caisson' literally means 'box', whereas a cofferdam is removed after the structure is completed, a caisson remains in place and forms an integral part of the structure. During the construction period the caisson functions as a cofferdam. A box caisson is a watertight timber or reinforced-concrete box having a bottom but no top. It's use is convenient when there is no excavation and the bottom of the river is more or less level; a box caisson also may rest on top of piles. The caisson is constructed on shore and floated to the site. An open caisson is a box without top or bottom, made of timber, metal, or concrete. An open caisson has heavy walls and sharp wedge like edges which allow it to sink with the aid of additional temporary loads and jets of water while the inside material is dragged out. The sinking of an open caisson proceeds at atmospheric pressure, and theoretically, there is no limit to the depths of sinking. When it is not possible to excavate wet ground in the open, pneumatic caissons are used. A pneumatic caisson consists basically of a working chamber and tabular shafts (generally two) provided with air locks. One of the shafts has a materials lock, which is used for removing muck from the working chamber; the other has a man lock, which permits the labor force to travel in and out. An example, of a stream originating in the mountains and flowing into an alluvial valley will be considered. It the stream is crossed at an upper reach or at the beginning of the middle one, a V-shaped narrow valley has to be spanned. In such a case there is only a little alluvium in the stream, the latter is not wide, and thus a one-span bridge with abutments on rock can be used. At its middle reaches, the stream gradually approaches the character of a mature stage. The cross section of the valley is wider and is trough like. There are boulders, gravel and some coarse sand on the shores. If the freshet (high water) is abundant and the water level high usually a high (as in the figure), one span bridge is needed. The immediate objective is to disclose the configuration of the rock floor and the stability of the rock as a foundation material. The quality of the rock material in the cuts on both shores of the valley should be investigated. This rock material, together with alluvium in the valley, may be used for concrete and, in any case, for building the approach embankments to the bridge. In the cases similar to those shown in the figure, the transverse gradient of the water table is probably from the stream rather than toward the stream (inversed infiltration). The water table may even be completely absent as in the case of the pit shown to the left in the figure. An example of such a crossing with a relatively shallow rock floor is given in the figure. Assuming that the valley has been found by erosion of original limestone beds and is filled with alluvium, sand and gravel, and boulders (left shore). The right shore is high and formed by sandy and silty clays developed on eroded and weathered limestone. The following set of structures has to be planned: (1) left-shore approaches to the bridge in the form of embankment on the terraces (2) a large bridge with a part of supports in the flood plain via duet or land piers and another part in the stream itself, and (3) a deep cut through day on the right shore to connect the bridge with the adjacent country. Accordingly the geotechnical work consists also of three parts, the simplest one being the study of the terraces on the left shore. Here, simply auger holes will do (boring 1 figure). A preliminary examination of the right shore slope should be made to spot any possible sliding or fissility. Emphasis should be laid on the study of groundwater conditions (direction and discharge). If the slopes of the cut will be in limestone, samples of the latter should be tested for solubility. When the position of the longitudinal axis of the bridge is established and the abutments located, the topography of the river bottom along the bridge axis should be obtained. In a wide river, there may be channels or depression, which are unfavorable for the emplacement of piers, and conversely sub aqueous islands ridges or outcrops may be suitable for this purpose. In large navigable stream, the location of the piers may be controlled by the large vertical and horizontal clearances that are required. A large span covering the deepest part of the stream channel, with a considerable vertical clearance (e.g. 30 ft) above the high water level, may be required for bridges covering navigable streams. This increases the height of the piers and, of more importance, increases the length of the bridge. In this case, a bridge proper degenerates into via duets on both shores of the stream. The abutments are thus moved far away from the stream, often to an elevated dry locality with a simplification of construction and no worry about proper location. A required vertical clearance also demands exceedingly accrete settlement computations of the bridge support in the navigable channel; since an excessive settlement may unduly decrease the clearance. A high bridge in this case always spans a navigable river with land piers on both sides. Under certain geological conditions e.g. when the river flows over a huge alluvial fan and it’s higher than the adjacent. Locating, the bridge would be extremely high; thus attempts should be made to locate the railroad or the highway in a tunnel under the river. Since a bridge crossing a river and it's delta is close to the shore line, the possible slow movement of huge sand masses toward and along the shore line should be considered. This precaution is especially important if a bridge has to be founded on friction piles. If the latter are too short, they may move downstream and deform and twist the superstructure. Civil engineers depend upon a proper appreciation of geology for their success and efficiency. Civil engineers can assist geologist by allowing them to examine excavations for study of parts of the earth's crust that otherwise would never be seen. Wherever, the civil engineer is asked to plan, design, and construct there will be a host of geologic considerations to be either accommodated or mastered. Environmental impacts within and around each construction site will have been minimized, and judicious layout and design will avoid creation of additional geological problems. The principles of geologic application to planning do not vary, although the particular features of different sites will. Planning begins with the identification of the main geologic features that will influence the environmental impact of design, construction and operation. The general geologic setting, climate, site hydrogeology, water supply, soils and a host of other features need to be considered. Seismic risks related to faults, landsides, natural cavers and underground space pose an additional geologic problem. Once listed, geological features must be considered individually on the basis of planning. Finally, site geology must be assessed as it is revealed by excavation, to ensure that design assumptions are correct and that no unusual or unsuspected features are present. Civil engineers have made significant contributions to the science of geology. All engineering geologists and civil engineers connected with construction are constantly on the alert for information that will contribute usefully to geologic on archaeological knowledge. Every exploratory boring or drill hole provides the civil engineer with what many geologists wish for, a verification of the accuracy of deductions made from surface observations. Geotechnical theory and a well-developed suite of laboratory testing procedures provide almost untapped potential for geologic utilization. The art of seeing the significance of the surface geology of each site and of the subsurface geology as revealed by the borings need to be developed. The geologic challenge lies in the art of seeing the exact interrelationships of the geology of the site and the requirements of the structure under design and of seeing the correlation of what excavation actually reveals with what was expected. 1. Preliminary investigation: Detailed and complete geological mapping. a) Basis of the stream: Basin area, length, elevation, character including vegetation soil, steepness, drainage including tributaries, existing dams and reservoir. b) Stage of the stream: Elevations and seasons of high water, ordinary high water, velocities at different stages. d) Stream bed: Character of the bed material upstream and downstream of the proposed site; obstruction to the passage of water or natural tendency to scour or silting around these obstructions; meandering tendencies and dental or channel regulations should be used such as deepening, widening, constructions of levees or bank protection. e) Drifts or Debris: Character, amount and size; appropriate vertical clearance of the superstructure needed for the passage of drift or debris; spans that may be required for that purpose.